Wind turbine safety had an ugly three weeks. 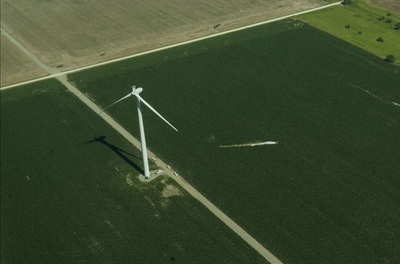 During the late hours of May 31, a turbine blade at NextEra’s Breckinridge Center in Oklahoma (in-service since August 2015), broke off near its base and was thrown to the ground – snap. 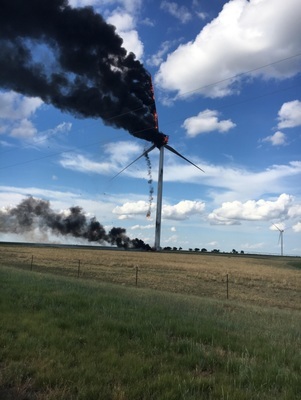 Days later on June 5 and 8, two turbines – one at NextEra’s Endeavor I site in Iowa (operational since 2008)and a second at EDF Renewable Energy’s Salt Fork Wind project in Texas (online since Dec 2016) — exploded into flames filling the sky with thick black smoke – crackle. 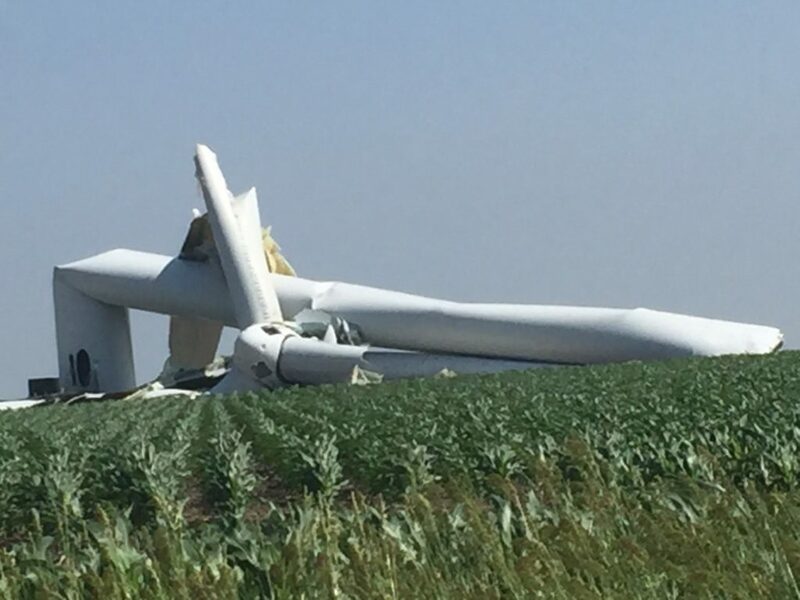 By time the air cleared, news arrived that another NextEra turbine, this one at the Nebraska Steele Flats facility (since Oct 2013), buckled and collapsed – drop. Collectively, the four failed turbines represented less than 16 operating years. Wind boosters were quick to insist that turbine failures are rare, isolated events and pose no threat to public safety. But looking back just six months the narrative rings hollow. Since November, turbine collapses have been reported in Rhode Island, Kansas, California, Nova Scotia, Ireland, Italy, Scotland, Germany and now Nebraska. Turbine fires occurred in Michigan, Pennsylvania, Iowa, the UK, Finland and twice in Texas. And numerous blade incidents have been reported (and unreported) including one in Michigan where a blade fell across an active snowmobile trail. Thankfully, no one has been killed, but it’s only a matter of time. 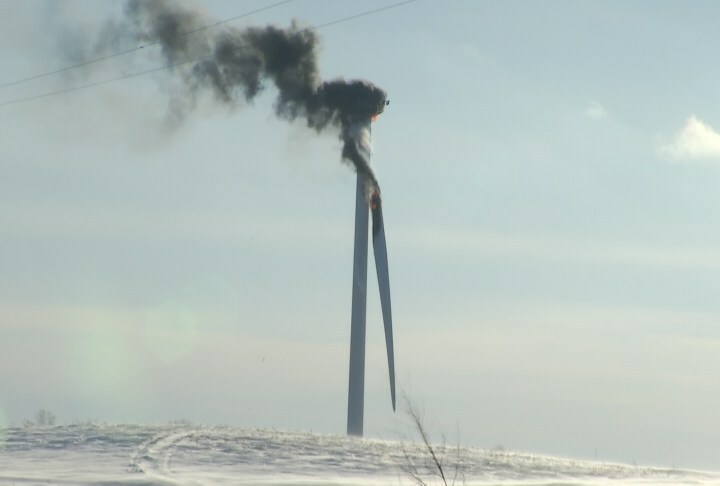 (Click here for a list of turbine failures in the Windaction database). Catastrophic failure of wind turbines is not new, and it’s not rare. In 2007, Spiegel Online published “The Dangers of Wind Power” where the authors cited the thousands of mishaps and accidents involving wind turbines and opined that “facilities may not be as reliable and durable as producers claim.” In 2011, the LA Times published “The Dark Side of Solar and Wind Power Projects,” in which reporter Tiffany Hsu examined how turbine accidents were surging. Recent experience show that not much has changed in the ensuing years. Efforts to establish safety setback distances beyond the industry’s preferred 1.1x turbine height to neighboring property lines have faced costly legal challenges with the industry claiming larger setbacks are nothing more than veiled attempts to stop projects from being built. But with each smoldering tower and shredded blade, communities are less willing to accept Big Wind’s definition of safe. Today, many more and bigger turbines are operating in widely varying geographic and meteorological conditions, which compounds the stress on blades, towers, and foundations. Add to this the pressure to get as many turbines in the ground as possible before the subsidies phase out and we’re looking at a continuing recipe for failure. It’s no wonder the green-conscious State of Vermont is seeking a setback rule of 10x turbine height to nearby residences. Others should follow Vermont’s lead. On January 14, 2016, Dan’s Mountain Wind Force LLC filed an application for a Certificate of Public Convenience and Necessity (CPCN) with the Maryland PSC to construct a 17-turbine (59.9 MW) wind energy facility in Allegany County, Maryland. The application before the PSC came after the company failed to secure a permit though the County’s permitting process and after they asked for and received an exemption from the state’s review process back in 2008. By returning to the PSC, the company hoped to get around the County’s denials. Following a lengthy adjudicative process, Terry J. Romine, Chief Public Utility Law Judge (‘PULJ’) for the Maryland PSC, ordered the certificate be denied. In her order, Judge Romine stated that any project benefits that might accrue to the public at large did not “justify or offset subjecting the local community to the adverse impacts that will result from the wind project’s construction and operation.” Dan’s Mountain appealed and last week the PSC issued its final order upholding Romine’s decision. A number of important findings were presented in both Romine’s order and the PSC’s reaffirming decision that would apply in other jurisdictions, but one in particular caught our eye. Judge Romine found that the Applicant failed to provide sufficient evidence to prove there would be no adverse visual impact on properties within 1-mile of the turbines. Rather, the visual assessment was dominated by views at distances beyond 1-mile where the simulated turbines appeared slight on the landscape. Judge Romine wrote that the ‘potential adverse impact’ on nearby properties could not be fully assessed or mitigated. The Applicant complained that a ‘potential adverse’ finding did not support the denial. The PULJ found that the Applicant failed to meet its burden of proof that the Project will have either no adverse impact or a minimal adverse impact on the esthetics of the areas surrounding the Project. …the limitations of that evidence cannot be balanced in favor of the Applicant. An applicant for a [certificate] cannot, through a failure to present sufficient evidence, somehow turn the term ‘potential,’ given the unknowns caused by its own failure, to its advantage. Those of us who follow the wind debate closely have repeatedly witnessed cases where projects were permitted despite an obvious lack of meaningful evidence on a host of topics and where that lack of evidence was applied in favor of the applicant. Invariably, such actions were justified by the opportunity to place renewable energy on the grid. The Maryland decision provides an important precedent that other states can and should now follow. Please Sign it by clicking on the link below and please also share it with everyone you know. There are only 1497 signatures to date, so it needs to move FAST ! Closing date for petition is 19/7/17. Could burning batteries be added to this list? Interesting timing for the announcement of a battery storage facility in South Australia just as the G20 summit got under way in Hamburg. The wind farm / battery host was given 24 hours to decide whether to allow the construction of a lithium ‘BOMB’ on their property. It all wreaks of a desperate attempt to hastily put together a tactic to influence Global commitment to climate change on the other side of the Planet in the face of President Trump’s withdrawal. It is also evidence of Musk recognizing a Premier who’s in a hole and terrified for his future. Not only was the decision to purchase this battery that is not proved to be suitable, we find now that SA will never own it, even after paying millions for it. 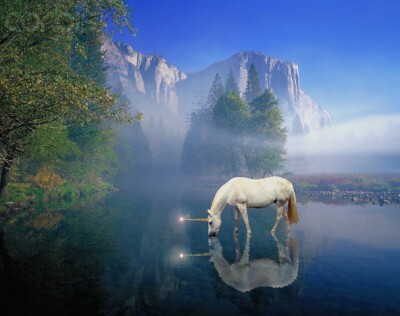 Also Weather – the dummy Musk recognised is saying the energy from the Wind Installation will be going to the State Government (not just the overflow stored in an unproven battery), yet from earlier information from both Neoen and the ACT Government it seems the ACT Government secured production from Hornsdale for themselves. The question is has this woefully inadequate Premier found himself in an even deeper hole, with the State in hock for the rest of time. Maybe I am wrong and maybe there is a deal being done between the ACT and SA, but as the Premier was not willing to disclose details of the contract, while Musk said it was OK to you have to wonder what this Premier has got his State into this time. If it does blow up which it very well could who will be responsible and will we still have to pay for? Just another little snippet, it seems the land for it belongs to one of the turbine ‘hosts’ who already has a number of turbines bringing in his ‘bacon’. Maybe he will be happy to have a big fry up. Yes Crispin desperate is the right word. Seems much lauded, subsidy funded, snake-oil-salesman Elon Musk is perhaps playing a desperate hand in linking-up with another desperate, about to be booted, unicorn farming, gambler Jay Weatherill. One must ask, are the Chinese about to take over Musk’s Tesla (Lithium) batteries will “save the world” Ponzi scheme?